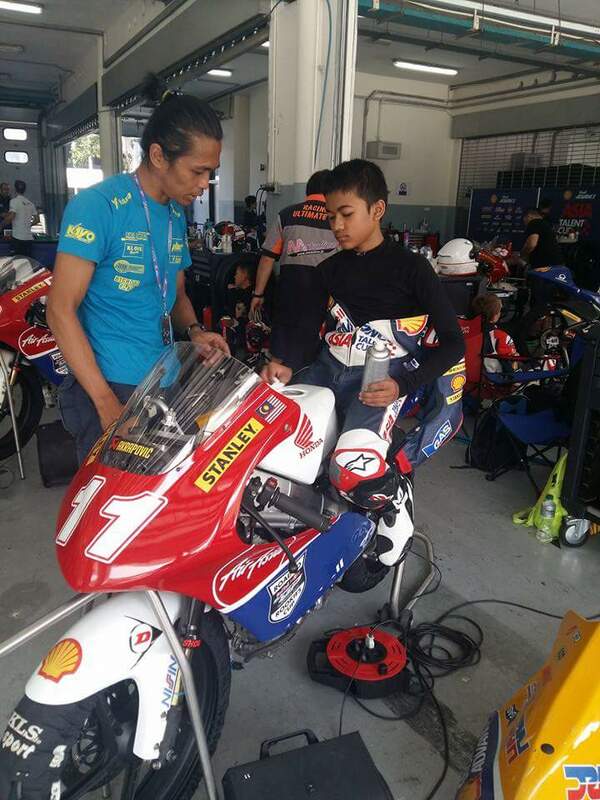 Being the only one from Malaysia to compete on the grid of the Asian Talent Cup series this year will be much more grueling to the young boy from Kuala Lumpur. Izam Ikmal started his journey in the 2016 season with a small hurdle when he crashes out during the 7th run on board the Honda powered Moto3 machine used for the series. Turn 15 of the Sepang circuit left unmarked by the crashed but the 13 year old boy couldn’t escape unhurt when he picked up a small injury on his right hand. The official testing session for the series which kicks off yesterday resumed today and will see a huge numbers of riders going about the circuit trying to understand the bike and the tires to be used in the competition throughout the season. Through his personal manager, we were told that Izam was trying to go in later to bake when he suddenly loses the control of the bike and saw him crashed to the ground. Luckily, the crash wasn’t more severe than what it can be which may just make the start of the season for the young rider who’s nicknamed as the “Pocket Rocket”. Despite the injury, he will still be continuing to ride in the second and final testing session today to get more crucial data before they heads off to Thailand in March 11th to kick off the 2016 season. Izam’s road to the Asian level of motorcycle racing has by far being pretty unknown to most motorsports fans here in Malaysia. He did not competed in any of the National level of motorcycle racing series such as Malaysia Cubprix or the Malaysia Superbike Championship. The boy graduated through the much amateur ranks of series such as the Malaysia MiniGP Championship and the Kuala Selangor series known as “King of 2T”. It will be very interesting to see whether the Pocket Rocket Boy will be able to bring up his game to a new level in the first few rounds of races here in the Asia Talent Cup series. He was supposed to be joined by at least two other candidates from Malaysia which pulls out from the competition due to some personal decision. Another Malaysian joining in the test is Idham Khairuddin who competed in last year series which will be determined worthy to join the 2016 series based on his performance from the two-day testing here in Sepanng. Get more stories and updates from us soon and please do hang out with us on FACEBOOK and do follow us on TWITTER for more info. Don’t forget to watch our film contents on our YOUTUBE CHANNEL to enjoy the full Malaysian Riders experience.